The impact assessment of the Common Agricultural Policy on transformation process of Polish agriculture following Poland’s accession to European Union has been carried out. The analysis took into account the changes of the Common Agricultural Policy in terms of goals and the directions of its evolution. 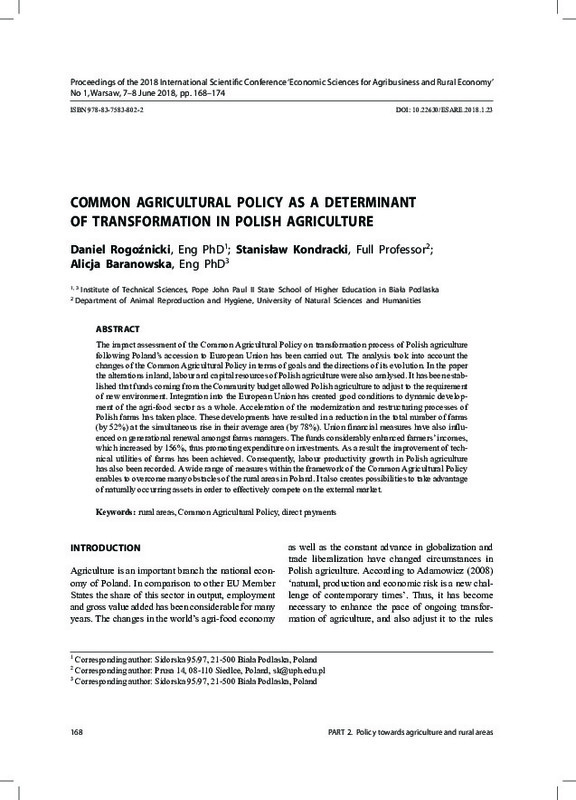 In the paper the alterations in land, labour and capital resources of Polish agriculture were also analysed. It has been established that funds coming from the Community budget allowed Polish agriculture to adjust to the requirement of new environment. Integration into the European Union has created good conditions to dynamic development of the agri-food sector as a whole. Acceleration of the modernization and restructuring processes of Polish farms has taken place. These developments have resulted in a reduction in the total number of farms (by 52%) at the simultaneous rise in their average area (by 78%). Union financial measures have also influenced on generational renewal amongst farms managers. The funds considerably enhanced farmers’ incomes, which increased by 156%, thus promoting expenditure on investments. As a result the improvement of technical utilities of farms has been achieved. Consequently, labour productivity growth in Polish agriculture has also been recorded. A wide range of measures within the framework of the Common Agricultural Policy enables to overcome many obstacles of the rural areas in Poland. It also creates possibilities to take advantage of naturally occurring assets in order to effectively compete on the external market.